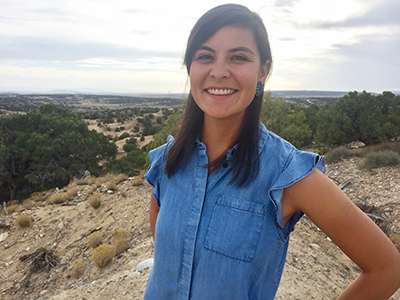 Kelsey Dayle John (Diné), a doctoral candidate in the Department of Cultural Foundations of Education (CFE) in the School of Education, has been selected by the National Academy of Education to receive a 2018 Spencer Dissertation Fellowship. According to the NAEd website, the $27,500 Spencer fellowships support “individuals whose dissertations show potential for bringing fresh and constructive perspectives to the history, theory, analysis or practice of formal or informal education anywhere in the world.” John was one of 35 fellows chosen from a highly competitive pool of applicants. In 2014, John received a National Science Foundation Graduate Research Fellowship. She completed a CAS in women’s and gender dtudies in May 2016, and an M.S. in cultural foundations of education in May 2017. She earned a B.S. in educational studies from Colgate University. John grew up in Oklahoma, and says that horses were her “first friends and first teachers,” and therefore influenced her research interests. She chose to pursue her studies in CFE at Syracuse because of the program’s interdisciplinary scholarship and pedagogy.